Danny Liu (Liu Dingyu), born 1940 in Chongqing, China, received his undergraduate Mechanical Engineering degree from National Taiwan University, his Master’s in Aeronautical Engineering at Georgia Tech (U.S.), and his Ph.D. in Aeronautics and Astronautics at the University of Southampton (UK). After seven years as an engineering specialist at Northrop Aircraft, he served as professor of Aerospace Engineering at Arizona State Univ. from 1982-2005. He also founded and headed ZONA Technology in Scottsdale AZ, and received numerous awards throughout his science career. As a violinist, he launched Taipei’s first string quartet in 1959, and the National Taiwan University String Orchestra the following year. He was a member of the University of Southampton Chamber and Symphony Orchestras. Danny’s art career began earlier in life than Tien-Call’s, mounting his first joint exhibit in 1959 as an undergraduate. His subsequent work included drawing, watercolor, oil, etching, and mixed media. After classes in pottery and design at the Univ. of Southampton, he furthered his painting studies in California and Arizona. His U.S. shows include exhibits at the Durant Ave. Gallery in Berkeley, CA, the Arizona State Capitol Museum, and the Phoenix City Hall. In 2012, he returned to Taipei, where he appeared in graduate seminars on ink painting at National Taiwan Normal University. In 2014, he mounted a joint exhibit of his and his father’s paintings at the Capitol Art Center, Taipei. Danny Liu’s Red Forest Studio, not far from Taipei, looks out upon the Danshui River and Mt. Guanyin, favorite landscapes. 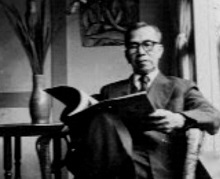 Tien-Call Liu, born 1896 in Toisan, Guangdong Province, China, followed his brother to the U.S. in 1914, where he was educated, returning to China in 1925 after his college graduation. He joined the mainland Central Bank of China in 1926, then in 1950 headed its accounting department in Taiwan, eventually directing the bank’s Taiwan stock exchange from 1963 until his 1969 retirement. In 1977, he settled in California and began painting, finishing more than seventy canvases before failing eyesight ended his artistic career in 1983. He died six years later at 93. Tien-Call Liu and Danny Liu, father and son, share a remarkable breadth of ability. Each excelled in professions usually regarded as “left-brain” and math-centered, Tien-Call as a financial expert and Danny as an aerospace engineer and engineering professor. Yet both became accomplished painters. Danny has also demonstrated his musical artistry as a university symphony and chamber music violinist. We have no idea how often such a span of individual talent arises in any population, but as a promise of human potential, it should be celebrated. Though critical categories can obscure, both painters seem to have inherited the shan shui (山水) or “mountains and waters” Chinese aesthetic/philosophical tradition, first prominent in the 5th c. Liu Song dynasty. Despite their contrasting manners, father and son look to similar natural phenomena as inspiration for their art. Share the post "Between Sky and Stream, Father and Son"